Spirit Rally & Talking the Walk take centre stage! Hot on the heals of Mik Artistik comes another set of live art events, this time down at Patrick Studios, and there could be pompoms!? 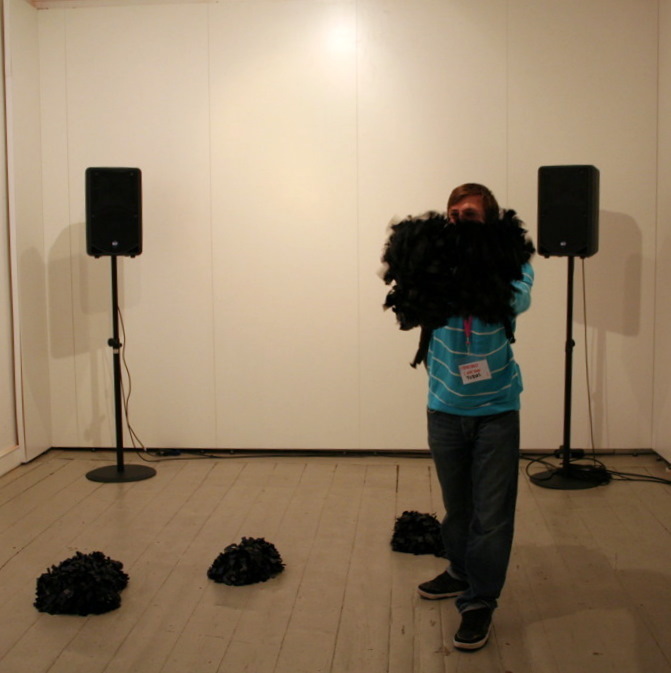 It’s a busy old art night in Leeds on the 25th, so why not get away from it a bit on the edge of town and relax in the knowledge that your contributions will be creating a sonic atmosphere of experimentation, as ‘Spirit Rally’ is an invitation to join the temporary committee and reclaim the act of co-participation! With a beverage or two and some snap in our bellies Graeme Murrell will relive 15 miles in 15 minutes of Over Here Over There, as he revisits, reinvents and regales us with the twists and turns of a rather extraordinary route between Leeds and Huddersfield, it’s not the A58 I can tell you! On October 25th 2006 the craniopagus twins Tatiana and Krista Hogan were born. Conjoined, backward facing at the head, they clearly share bone, veins and arteries. Their neurologist states that they also share a cerebral cortex – the part of the brain that is believed to play a central role in memory, language and perception. Thus, Tatiana and Krista, whilst never being able to meet each other’s eye, may share a portion of a psychic existence: ambiguously separated physical selves inhabiting a single interior mind. The uncanny mirror of this proposition is a single physical self internally fractured by a disruptive other. The cultural myth of the twin however, allows us to both explore and distance ourselves from the unsettling reality of our internal conflict, and is rich with the contradictions that feed our anxieties about an unbalanced mind. The uncanny clone-like telepathy of The Midwich Cuckoos (John Wydham Lewis 1957), is countered by the good / evil dyad of the Hammer Horror film Twins of Evil (1971), where the externally identical Maria and Frieda manifest both the pure and virtuous mind, and its perverse and libidinous opponent. The Strange Case of Dr Jekyll and Mr Hyde (Robert Louis Stevenson 1886) is centered upon anxieties about the double self to the extent that the actual physiology of the subject alters to mirror its psychic state. 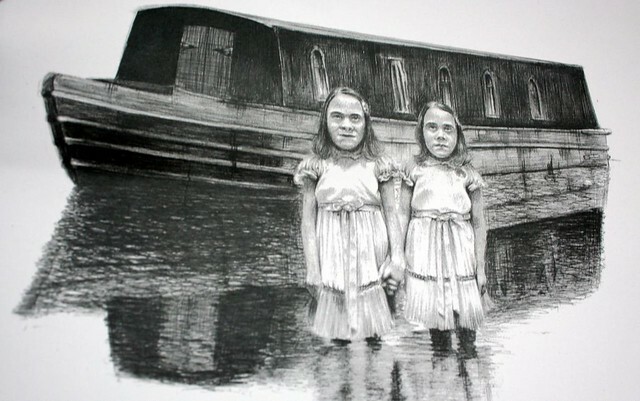 Much media representation of Tatiana and Krista, and other conjoined twins provide us with a dehumanized ‘spectacle’ that is profoundly unsettling and irresistibly fascinating precisely because it visually reflects both the vicious doctrine of the ‘healthy mind and healthy body’, (arguably in itself a Victorian inverse of the freak show aesthetic), and more importantly the psychic blurring of the boundaries between the healthy self and the pathological other that the concepts of the ‘normal’ and the ‘ideal’ resist. Most coverage of these twins gives us no narratives of a complex and continuing human existence, and refutes any experience of an ordinarily rich life. The adult lives of these individuals are rarely portrayed, except where a ‘freakish’ gift can be posed as a melodramatic or sentimental counterpoint to their tragic disability. Lori and Reba Schappell, the most widely described adult craniopagics, are defined almost exclusively by Reba’s career as a country and western singer. The National Fairground Archive comments that in the freak shows of the nineteenth century, ‘the most popular attractions were oddities with extraordinary talents’. The intersection at which these lives come under scrutiny, at which our viscerally anxious fascination is revealed, is at the tortuously extended moment of their dangerous surgical separation. In the case of back or side facing craniopagics this is the imagined perilous point at which they will turn and face and stare, in which their eyes, the supposed windows of their souls, will either be successfully penetrated or irrevocably shattered. The ambivalence of such procedures, paradoxically posed as both vital and life threatening, reflects our own uncertainty about our wish to see ourselves, secretly fearful that the act of seeing may force us to lose a darkness for which we dare not admit our yearning. This seemingly healthy act of a psychically eugenic form of self-examination, is designed to light the path of a clear and unconflicted life, and to eradicate a troublesome interior darkness, in which we sometimes stumble, disorientated and dreamlike: it is a cruelly lit mirror that allows the beauty of existence to have no flaws, and whose glaring shine harshly and irrevocably splits off that which intrudes upon our ideal. A softer light upon a reflective surface might not exclude a positive and progressive psyche, but allow for fluid exchange between ourselves and our dark other that is only possible across a boundary blurred, a mirror become a mist. The clarity of a single path, which conceptually purports to steer us ever onwards through a life which begins with a hopeful birth, and ends with a satisfactorily peaceful death, in which we congratulate ourselves upon a fulfilled potential seemingly untainted by uncertainty and doubt, is in fact a narrow and prosaic road which allows for none of the creative and poetic blunders and diversions which truly illuminate our rich potential. In reality, a life defined by a cold cycle of an impenetrable rock orbiting slavishly through the vacuum of a bleak prescriptive space offers no richness. Nor does the pitiless light and the sterilizing heat of a merciless sun allow for a sensual organic growth of our psychic selves. Without the blackness of night, or the liminal grey of dawn and dusk, the contemplative, creative, and conflicted luminescence of the day would not exist. The mind that does not struggle cannot prevail and the heart that does not break cannot feel love. In August 2007, it was declared that Tatiana and Krista could not be separated, due to the likelihood of the surgery killing or paralyzing one or both the girls. However, doctors stated that they are doing well in terms of health issues, and it is reported that when in distress, the soothing of one of the sisters will cause the other to cease her crying, and that when one of the twins is tickled, the other also laughs. Alice Through The Looking Glass. Lewis Carroll 1871. With thanks to Richard Shields, whose Shining Twins provide the darkness for my stumbling text. Contents May Vary have been working like blighters down at 105 to get the Propellart up and running, with a super mix of artists converging after having spent a 24 hour residences on the ‘Northumberland’ as part of Boatelier. With a mix of projection / sound/ drawing / print / live art actions, it should be a pretty spectacular night… and we pondering on the production of a rum based cocktail, just to mix it up a little!? 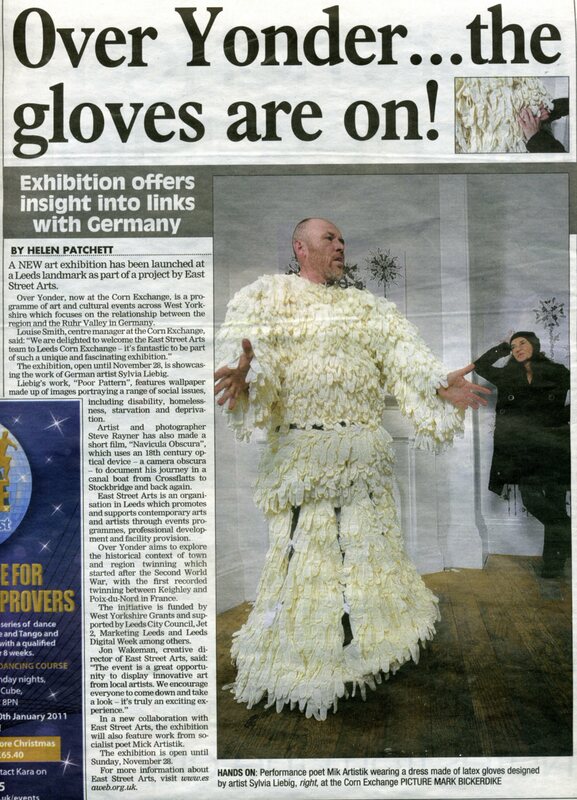 It was great to get a bit of coverage in the Yorkshire Evening Post today, and Mik is looking rather splendid in his Gown of Gloves, as the Self Protecting Poet. So have a gander at the article, it was pretty good we thought. 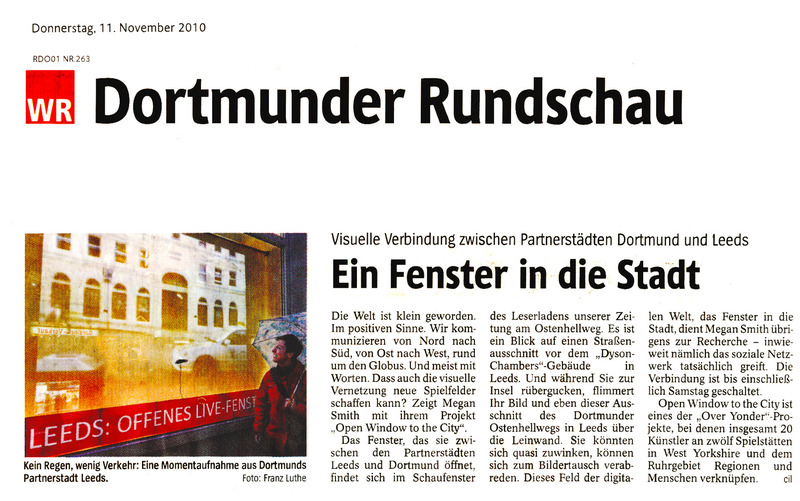 We have been supported throughout Over Yonder from International Leeds as our twinning efforts with Dortmund fell well within their remit, which was much needed on our meager budget for this, our last Social Club programme. Alex there has been great and without who’s translating skills and connections would not have made a lot of activity possible! Thank you! We got a great bit of coverage in their monthly newsletter and our project with Greame Murrell would have struggled logistically without further backup from Jet2 and Düsseldorf International airport, where Greame’s piece now resides for the until the end of December (we are looking forward to some images too of this mammoth 4m x 2m image! ), thanks here go to Marketing Leeds for their support in production… in fact its been a real team effort! Have a look at the Autumn International Leeds, with a much smaller version of Over Here Over There! We had a very comprehensive review of the opening event at the Corn Exchange from one of Culture Vultures beetleing bloggers, which was great considering the amount of events going on that evening. As far as I am aware there were openings at 42 New Brigate with Slice, one down in Holbeck curated by Simeon Barclay (here at Patrick Studios) and certainly a largish event going on up at Shine with a show from Jo Dunn. This is all great stuff for Leeds with so much going on and a real choice for audiences to what they want to attend, my only reservation with all this activity is that we (the visual arts scene) lack a solid presence within the wider world of comprehensive listings services, LVAF is great but we really need something better for us all! Anyone one want to play? It was a really good evening last night at with a good turn out who witnessed a rather special performance from Mik Artistic in a very special suit as the ‘Self Protecting Poet’ Super stuff. Opening as well was Steve Rayner’s short film of Navicula Obscura, which documented the process of turning his narrow boat in to a camera obscura… fascinating stuff. 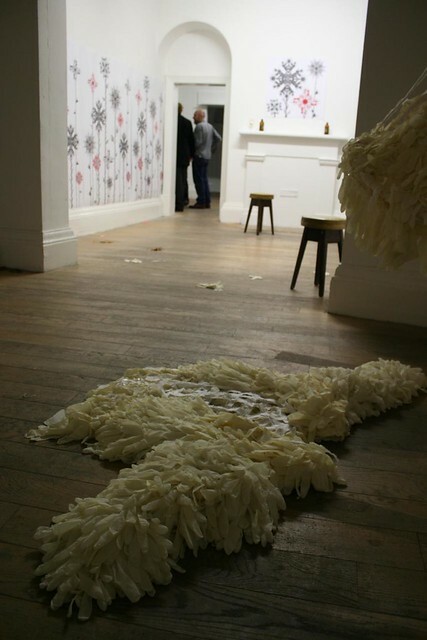 Do pop along as it continues to the 21st Nov.
At the Corn Exchange tonight (Thursday 11th Nov) you can come and be the first to view new works from Silvia Liebig and Steve Rayer, along with a one-off tonight only super performance from Mik Artistic… You will never see him like this again!! All at the Corn Exchange from 6pm. A light refreshment or two will be available. All welcome! 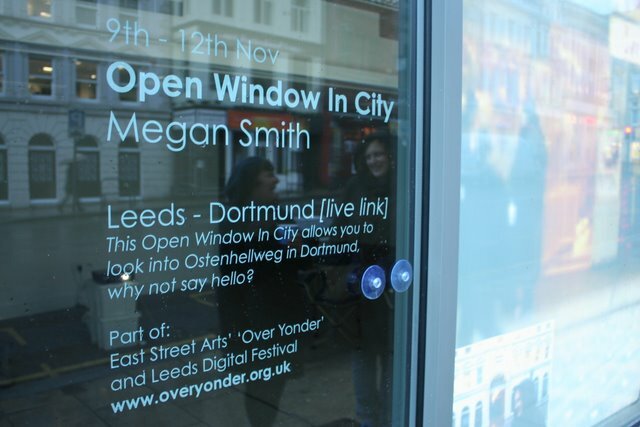 Open Window In City is now up and running until the 12th Nov. Though we have a few glitches along the way Megan Smith’s piece is now live, with oodles of help from Michael Odenwaller in Dortmund! 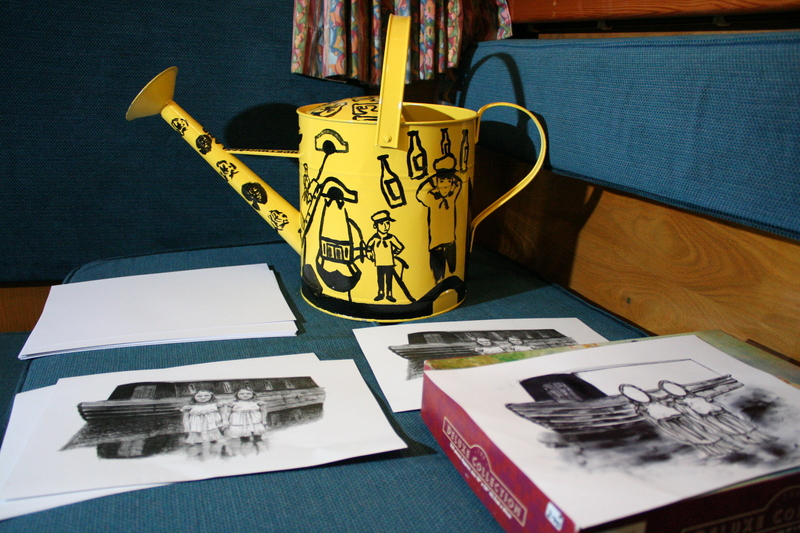 If you want to take a gander pop along to lower Briggate and Dysons Chambers… looks good!